REHOBOT Hydraulics spent a day in a forest, together with lumberjack Anders Nyqvist, in order to evaluate various methods for directing the fall direction, when felling various sizes of trees. Anders has many years of experience in forestry and he was interested to test the REHOBOT hydraulic spreader to direct the back-loaded trees which do not fall naturally in the required direction. Manual spreader HS20-120 was a good choice, especially when it came to high demand on performance and ease of use and where no external power source was available. 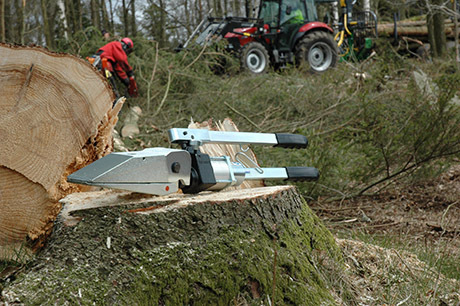 Normally various types of tree felling jacks are used. But those can be bulky and heavy and are inconvenient to move around in the forest. If the ground is wet, or soft, the jacks can become unstable and lose their function. Another common method for tree felling is the use of plastic wedges, however, this can be a time consuming process as multiple wedges need to be hammered into the tree. They are difficult to keep in place and if they become dislodged the process has to be restarted. 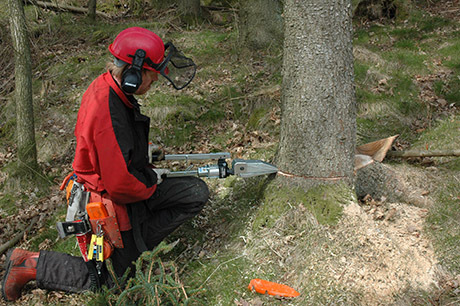 When felling slimmer trees, the wedges are often too long and cannot be fitted into the tree. Result: After trialing the REHOBOT HS20-120 on both larger and smaller trees, Anders was very happy with the result and the working method of using the hydraulic spreader. The spreader was easy to position where required. The edge of the spreader was inserted into the tree, followed by manual pumping of the handle. The spreader’s weight of only 9 kg makes it very portable, perfect for forestry applications. The spreader can be used in any forestry environment. The serrated teeth in the wedge provide a steady grip on the tree, regardless of the weather conditions. Anders continued to use the spreader in various environments in the forest and also to fell trees next to buildings, allowing safe and precise felling.